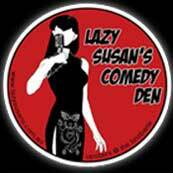 Tucked away upstairs at The Brisbane Hotel, Lazy Susan's Comedy Den has been tickling Perth's funny bone since 2004. We've got live comedy shows every week, including sidesplitting stand-up, improv genius and experimental comic chaos. It's our mission to make you laugh. What are you waiting for? Come and get your funny on at Perth's original dedicated comedy club! Big laughs, top talent, a great night out! Laugh off the working week with the nation's finest stand up comedians. Each Friday features a hilarious MC (your master of ceremonies), a professional headliner comedian plus great support acts. As well as frequent touring interstate and international performers, Lazy Susan's is often the venue for feature comedians previewing their comedy festival shows. See them here before the rest of the world catches on. The Big HOO-HAA! is a night of comedy that'll help you forget your troubles and have you laughing out loud from start to finish. If theatre and stand-up comedy met one night in a smoky bar and after a few drinks found themselves in a compromising position in the back of a clapped out '67 Volkswagen, the result of this sordid tryst would be The Big HOO-HAA! In the style of Whose Line Is It Anyway? and Thank God You're Here, The Big HOO-HAA! sees two teams of fearless comedians take to the stage to do battle in a competition of wit, humour and bad mime skills. It's a no-holds-barred race to the punch line. This is an interactive show that uses audience suggestions to create improvised comedy sketches. Launched in 2002 by Cut Snake Comedy, the show has gained a huge following over the years, performing to sold-out audiences most weeks. Come and see one of Perth's greatest comic treasures (but book tickets so you don't miss out! ).